The E-Wheels EW36 has taken pride many times over being the fastest mobility scooter within the United States. It can go up to top speeds as high as 18mph and can ride for about 45 miles on one single charge. The scooter also has an anti-theft alarm installed and is also equipped with dual shock absorbers on the frame, as well as being a sturdy, large three-wheeled scooter in general. Looking for something more portable? Try one of these top-rated folding mobility scooters and grab a portable wheelchair access ramp! Don’t forget to invest in a reliable mobility scooter ramp or a top-rated wheelchair ramp for your home. Equipped with an effective and powerful 500 Watt electric motor that rides quietly, without disturbing the neighborhood and passers-by, the e-wheels EW36 is a powerful scooter. The power wheelchair electric motor is both brushless and transaxle and has a 48V battery inserted, too. With all these specs in mind, it’s no wonder that the E-Wheels EW36 remains to be one of the fastest recreational scooters of its kind on today’s market. With the 45-degree turning radius, the power wheelchair scooter has been specifically manufactured so that you can maneuver well around public places where there are many obstacles in sight. The motor is also capable of handling an incline of at least 20 degrees, which is almost unheard of for other recreational scooters of this caliber that are available on the market. The front and rear braking systems ensure that the driver has stability and comfort when driving and that they have full control of the steering mechanisms. Sudden stops won’t be a problem. Whether you’re driving and you see an animal jump out unexpectedly or a passerby in a rush, you can brake immediately whenever you need. The adolescent electric scooter is made to be reliable, stable and effective every time to ensure maximum safety when driving. It’s also important to note that the brakes of these EW36 Mobility Scooters are electromagnetic, which makes them easily usable by the rider whenever they need. The tires of these EW36 Mobility Scooters all have a circumference of 16”, while the two back tires have rear shock absorbers that help the electric mobility scooter move around smoothly on various terrains. If you are on an uneven pavement or road, you can let go of your worries and drive forward without paying attention to damaging these EW36 Mobility Scooters. Uneven ground is not a problem for the EW36 mobility scooter, and that’s one of the features that makes it so highly effective and sought-after. It’s ideal for city and neighborhood life, as well as crossing less developed, more dirt-road type roads. As a 3-wheel scooter, the rear wheels also have anti-tippers installed; these can give the rider and even greater sense of confidence when riding. These small devices can easily prevent small accidents that can be easily avoided, helping both the travel scooter stay safe and protected during the ride. The EW36 power wheelchair scooter is considered to be one of the fastest recreational scooters on the market, and it’s no wonder with its 18mph maximum-speed. The e-wheels scooter itself has variable speed control, and you can go from easy-going cruising speeds of 1mph to fast, last-minute-drives that can speed at top speeds around 18mph. You will be able to control the speed flawlessly by twisting the throttle. Coupling this with a front and rear braking system, all rides on the EW36 are designed to be safe. No matter where you will need to go, or how fast, the EW36 power wheelchair will be able to get you there as fast or as slow as you want. Whether you will want to use the travel scooter indoors or outdoors, both scenarios can be handled exceptionally well by E-Wheels EW36. The travel scooter even has a special switch that can be flipped between the outdoor and indoor modes to allow for the ultimate experience on both floor and road surfaces. The indoor mode naturally has a much lower maximum speed, which protects from accidentally speeding within the home, or from keeping the kids from abusing the electric mobility scooter themselves. With every travel scooter battery charge, you will be able to travel up to 45 miles per charge. This means that you won’t have to worry about the electric scooter running out of battery quickly when you are enjoying your time outside, or within your home. The travel scooter itself features a 48V sealed lead acid battery that is 100% maintenance free. 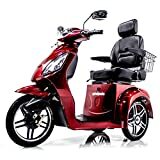 The E-Wheels EW36 travel scooter also has various other features, like a big cozy padded seat, comfy armrests, a big storage basket located behind the seat, an anti-theft alarm installed to keep your electric scooter safe and the rear shock absorbers that we discussed before. It’s also important to note that you won’t have to fiddle with assembling this electric mobility scooter. Other features include a USB port, a phone holder and key start remote. Problems with your knee? Try a reliable knee scooter for all terrains. The rear basket can hold up to about 20 pounds of luggage. This makes it the ideal travel companion no matter where you’re going. Whether it’s for shopping, running errands, or picking up a delivery. 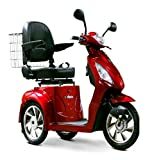 The EW36 Scooter will be able to carry or your belongings, shopping bags, and wheelchair accessories whenever and wherever you need. If you find that the rear basket is not enough, you can lift up the seat of the EW36 Scooter and you will find an additional storage space where you can store all of your personal possessions. The EW36 comes in various colors, ranging from the default red to blue, orange, pink, white, gray, purple, yellow and lime green. 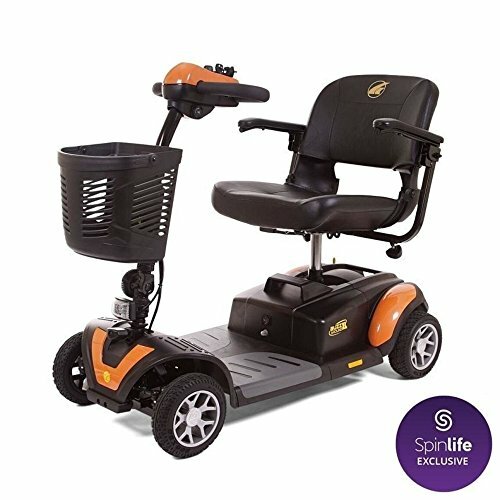 This top mobility scooter also has a bright and effective headlight that you will be able to use when the sun starts dimming outside. It’s clear that this travel scooter made by eWheels has been made with safety products and protection precautions as being the first in mind. It’s 100% assembled from the get-go right from the moment it arrives on the wooden pallet. No need for screws, drills and endless instructions; you will be able to ride it from the get-go after the battery charge! As the fastest mobility scooter, the EW36 can carry up to 350lbs and its own weight equals to about 200 lbs. The exact dimensions of the EW36 Scooter can also be summed up to be 61” long x 29” wide x 41” high. The EW36 Scooter can be considered the ideal mobility scooter for adults, teenagers, kids and seniors. Every age group can ride this top mobility scooter, and it has been designed to be 100% for everyone. No matter if you need a new device to help transport you from you home to work, or if you want an indoors travel companion to help you get around, the EW36 Scooter is ideal for all situations. Thanks to all of its features, it can be considered the ideal travel scooter for both indoor and outside use. It’s 100% versatile, can be used by anyone and the EW36 comes fully assembled so that you can start using it from the get-go. This means that everyone can enjoy a ride on the EW36 Scooter, no matter if it’s for errands, chores, or simple fun rides around the neighborhood. We are fond of the EW36 Scooter for a few reasons. First of all, it can travel up to 45 miles per charge (single charge). This is almost unheard of for other heavy duty scooters of similar build on the market. The twist throttle allows monitor speed control between 1mph to 18mph, and the travel scooter is simply packed with useful features that are helpful with everyday life. Features such as under-seat storage spaces, storage baskets, an anti-theft alarm and much more. This electric mobility scooter has been made to be safe and effective. We can say with 100% certainty that eWheels have managed to release one of the most reliable and most heavy duty scooters on the market with the EW36. Who said you couldn’t get fast mobility scooters? If you are not convinced about investing in the EW36 Scooter, we have another alternative product that may be more up your alley. 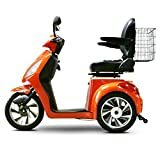 Its also packed with free scooter accessories such as the rear basket and convenient cup holder. The LED headlight is 100% adjustable at any angle, and if you will want to disassemble the electric mobility scooter, you can do so flawlessly since it’s fully wireless. Upon purchasing the travel scooter, you will also get a two-year warranty. All in all, the Buzzaround XL can handle about 300lbs of rider weight and comes in green, orange, blue and red designs that you can choose between. You will be able to travel up to 9 miles per charge, which is perfect for quick errands and fun rides around town. Travel Up to 45 mile range per single charge! Also included a reverse gear, armrest and large storage basket. If you liked the article, please leave your feedback. Passionate writer, Scooter Dad, Father of two, Super active, Tough Mudder conqueror reviewing the some of the top sports related products me and my sons use and love. If you have any suggestions for improvement of MPS, please ping me a message.